October 22, 2016. The wedding images of Dina and Myles taken at The Cielo Blu Barn in Fellsmere, Florida Once again we feature close up images of the wedding rings. 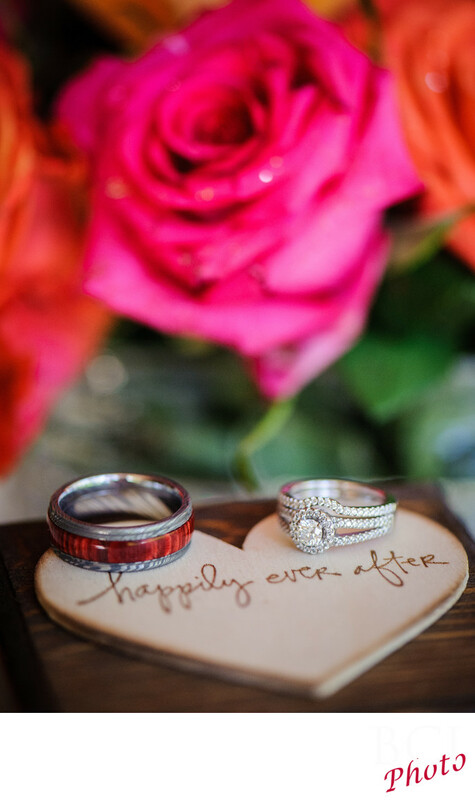 As is our norm, we also bring in some extra props that set the stage for our couples wedding ring images, as shown here the brightly colored flowers are offset by the relatively simple heart ornament appropriately adorned with happily ever after. Note the cool wood tones to the grooms wedding band as well.